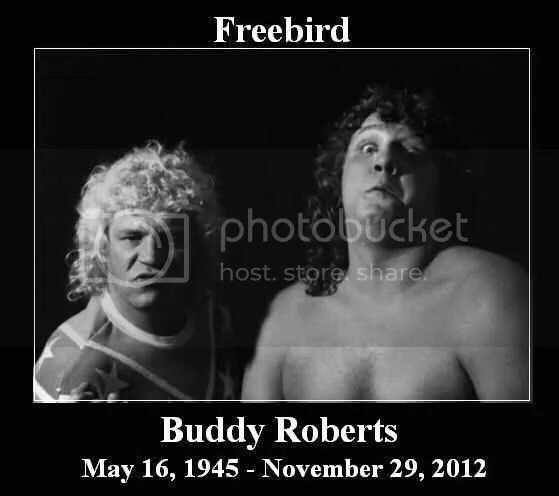 “Fabulous Freebird” Buddy Roberts passes away. Buddy Roberts, one-third of the legendary Fabulous Freebirds will forever be remembered in a classic and memorable feud with the Von Erich’s in the 80’s. Today, Roberts pass away and I am going to share with you a photo and a match from his career that by now you have seen or at least should see. 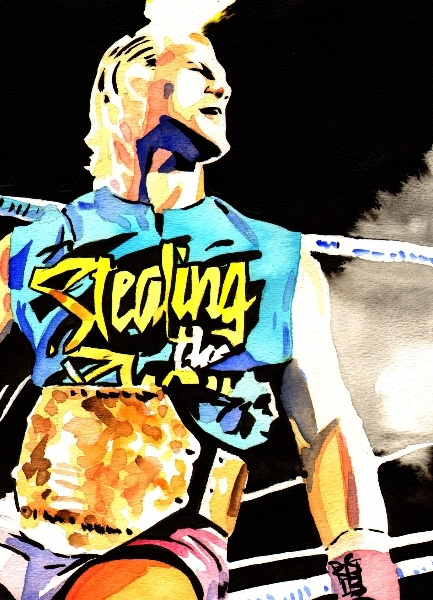 To be honest, I never saw Roberts wrestle in person and never spoke to him. Still to this day his image is fresh in my mind as the Freebirds and Von Erichs matches excited me as it did for many fans of that era. Though this is a post talking about the superstar Buddy Roberts, my thoughts goes out to his son second generation Buddy Roberts Jr. I have had the pleasure of meeting his son while covering MECW wrestling in Woodriver, Illinois a few times and have found him to be a great guy. I used to joke to him about the desire of getting him to come make an appearance to MECW so I could have the pleasure of meeting him. Roberts Sr. though at his age after years of touring the country on a daily basis during the territory leagues had slowed down while staying closer to home. Buddy has worked hard the past few years to improve his skills and working with Pro Wrestling Blitz and including taking part in last year’s Harley Race’s World League Wrestling, Pro Wrestling NOAH and WWE camp that quite fittingly had special trainer Kevin Von Erich included with his sons Ross and Marshall in the camp as well. Thankfully the two wrestling families were very happy to see each other and a special moment was had by all. It is with a heavy heart that I send our best wishes to Buddy Jr. and his family during this moment in their lives, after losing a father myself last year I can attest to the fact that it is a very difficult time. Rest in peace Buddy Roberts from everyone at Missouri Wrestling Revival. Happy Holidays everyone, earlier this month we made our way to our good friends at MECW for their final show of the year. Santa was on his way and we were to give away the first of only two MWR Holiday t-shirts, a free gift bag and MECW was giving away a Christmas ham. This was also their annual toys for tots, that allowed a fan to bring a five dollar toy they got free admission for a kid into the show. Brian was excited to see that Brandon Aarons was going to be in action and asked for him to throw out our shirt prior to his match with Shawn Santel. Next up was Tiger Roth who was a fan of the MECW Champion Bailey Mannix who grabbed the Lovely Leon as he is walking by. You can see the look on Mannix’s face as the tension between the two have been at a boiling point. Nevertheless the Champ is a true professional and took the picture with the fan. 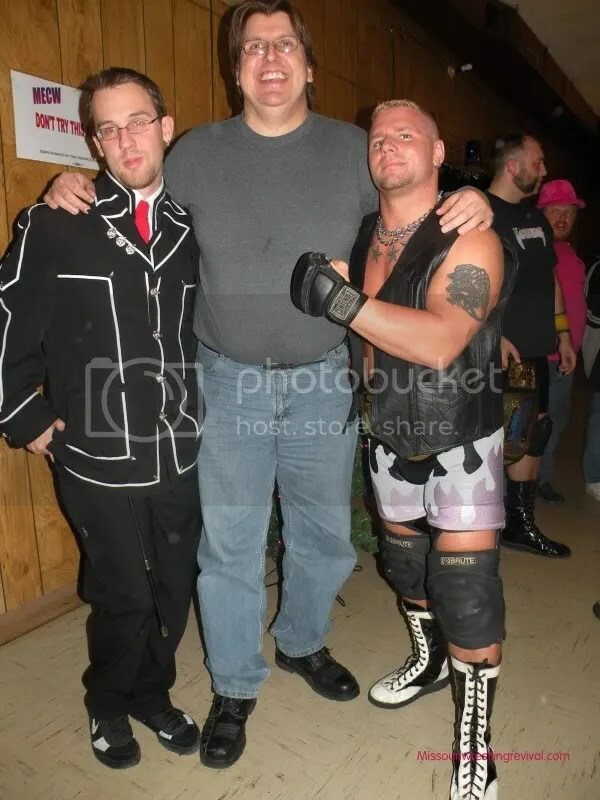 Ron Hobbs was also happy to meet the top wrestler in MECW, Bailey Mannix while his friend Shannon Courto was very impressed with the looks, I mean wrestling skills of young Brandon Aarons. As we saw in the past Shawn Santel brings the fans.On this night it was no different as Harry Baumeister, Steela Hernadez, Kaleb Harshbarger, Noah Young, Marissa Scoggins, Cheyann Motley, and Sheryl Baumeister was thrilled to pose with the fans at ringside. Brandon Aarons wore the MWR shirt and threw it you Noah Dagley who posed with big time MECW fans and MWR friends Chad and Kim Dagley and Ricky Lynn. 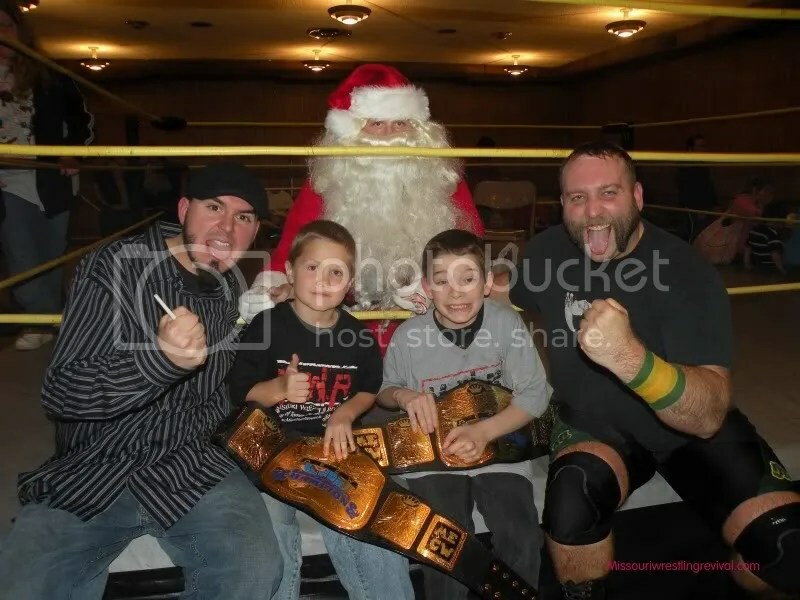 Ricky Lynn & Noah Dagley also had the chance to take a photo with The Brawlers and their special guest Santa Clause. This most likely will be the last Dubi Meets the Fans before Christmas, I hope everyone has a happy and safe Christmas. 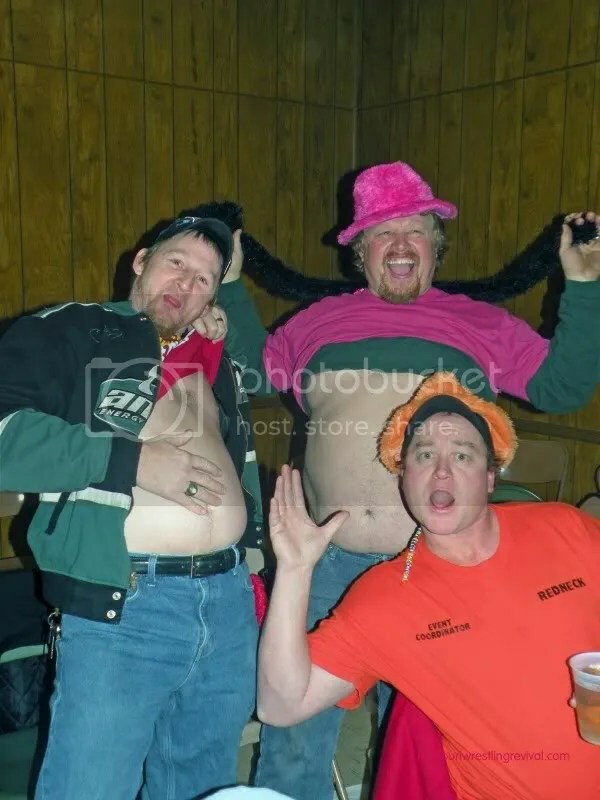 Join us after then to see Dubi Meets the MMWA-SICW coming to you from East Carondelet Illinois .